April 1, 2016 – The secret to planetary formation and working on asteroids lies in a handful of glass beads and meteorite fragments. These materials are the main component for the Astromaterials Research and Exploration Science (ARES) experiment Strata-1, a payload designed to test how regolith, or impact-shattered “soil”, acts on small, airless bodies like asteroids, comets and the Moon. Strata-1 launched to the International Space Station (ISS) aboard the Atlas V/Cygnus resupply mission on March 22. 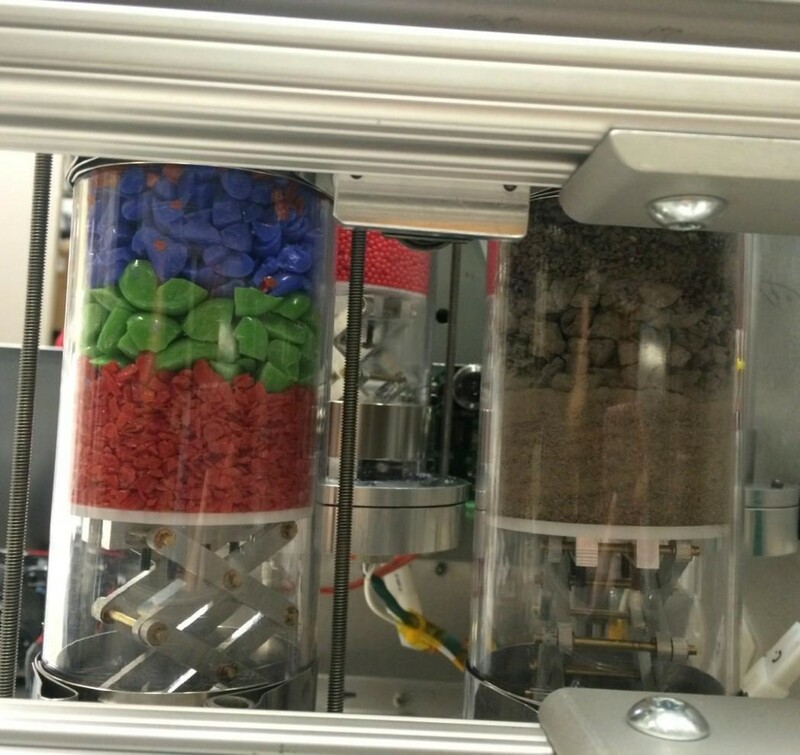 The experiment is, as Deputy Project Manager Kristen John, Ph.D. said, “A true science experiment,” and one regolith experts have been looking forward to for 25 years. Regolith is the impact-shattered “soil” found on asteroids, comets, the Moon, and other airless worlds, but it is different from soil here on Earth in that it contains no living material. Strata-1’s goal is to give the space community answers about how regolith behaves and moves in microgravity, how easy or difficult it is to anchor a spacecraft in regolith, how it interacts with spacecraft and spacesuit materials, and other important properties. Strata-1 is the result of the collaboration of many different institution across the U.S. including NASA Johnson Space Center in Houston, Texas; University of Central Florida in Orlando, Florida; Southwest Research Institute in Boulder, Colorado; and University of Colorado in Boulder, Colorado. The CU team is formed by Professors Daniel J. Scheeres and Paul Sánchez; additionally, Christine Harzell, a CU alumna and former member of Scheeres’ lab, is also involved. Hartzell is currenly an Assistant Professor at the University of Maryland. The CU members were included in the team due to prior research in granular matter simulations in micro-g environments and the Geophysics of small planetary bodies. The development process of typical flight projects has a 36-month template, more than three times the ten months allotted to develop Strata-1. There were some tough decisions to be made in a short time frame. 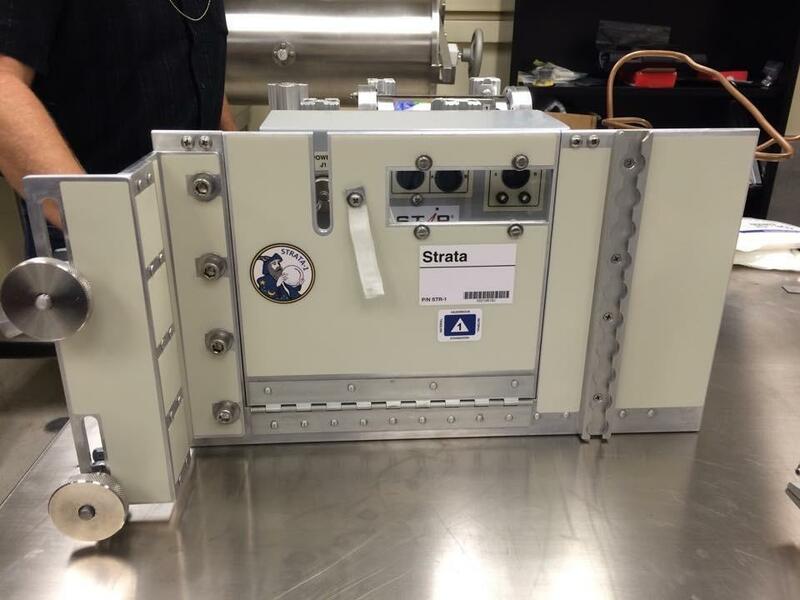 By using already existing flight hardware and doing much of the work in house, the Strata-1 team met the deadline and came in just under budget. In fact, because of the Strata-1 team’s work, the development process of flight projects has been dramatically streamlined, and can now easily adapt to accommodate a 10 month timeline. In simple terms, Strata-1 is composed of four transparent tubes that contain granular materials of different shapes and sizes. 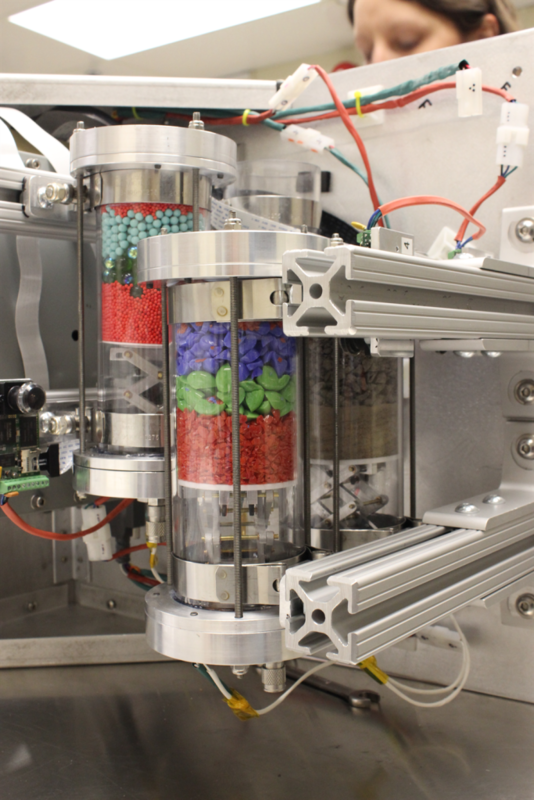 The contents of the tubes are initially tightly packed (imagine filling a tube with rice here on Earth.) The tubes will be on the ISS for 1 year, during which time they wil be exposed to small vibrations of the station caused by spacecraft docking, astronaut movement, etc. These small vibrations will cause the grains to move and change from their original segregated set-up. Since so little is known about regolith behavior, it was difficult to decide what type of materials to use and it was here that the expertise of the CU team was most needed. With the CU team’s advice, and the collaboration and approval of everyone involved, four tubes of different materials were chosen – the tubes would contain spherical glass beads, crushed glass fragments, crushed meteorite simulant and finally, crushed meteorite fragments. “The first tube allows the use of computer simulations to replicate and better understand the results; the second provides an insight into the influence of the shape of the particles; the third and fourth allow us to understand the influence of the density; and the comparison between these two helps us see if the simulant is actually a good simulant of the real material,” said Sánchez. The study will use photos of the tubes taken on orbit as well as computer simulations to understand the size segregation of the granular matter. Cameras will take photos as the materials interact with microgravity and, every three months, a suite of four SD cards is swapped out for blank cards on the Strata-1 instrument, and the data on the used cards is transferred to an ISS computer for transmission to Earth. The photos will be analyzed a couple of ways as well as edited together into time lapses to show the movement of the materials in microgravity. Finally, after a year in orbit, the experimental results will come back to Earth for analysis and the CU team will be heavily involved in the simulation part of the study. The knowledge gained from the Strata-1 experiment will be fundamental to the proposed NASA Asteroid Redirect Mission (ARM), an integral part of the agency’s Journey to Mars. ARM will advance new technologies and provide valuable spaceflight experience. It’s important to NASA to know how to set anchors in regolith, how to safely move and process large volumes of regolith, and predict and prevent risk to spacecraft and astronauts visiting these small bodies. Additionally, understanding the whole-body context of material returned to Earth from small asteroids, such as by the NASA OSIRIS-REx mission, the JAXA Hayabusa 1 and 2 missions, and ARM is scientifically beneficial. Strata-1 was developed under Principal Investigator Marc Fries, Ph.D. with Project Manager Lee Graham, Deputy Project Manager Kristen John, Ph.D., and a dedicated science team. Daniel Durda of the Southwest Research Institute is a co-investigator.